Sopore, Jan 24 : Thousands of people attend funeral prayers on Thursday of three slain militants killed in an encounter with government forces in Binner area of north Kashmir’s Baramulla district on Wednesday. According to reports, thousands of people including women and children gathered on the funeral prayers of slain militants in Baramulla, amid pro-freedom sloganeering. Shoaib Akhoon Top Lashkar-e-Toiba commander of Khanpora, his two slain friends Mosin Mushtaq of Qazi Hamam and Nisar Darzi of Jamia Mohalla old town Baramulla were killed in a gunfight with government forces at Binner village of Baramulla on Wednesday. An eye witness said that thousands of people from Baramulla areas and other adjoining localities assembled at old town to offer funeral prayers. 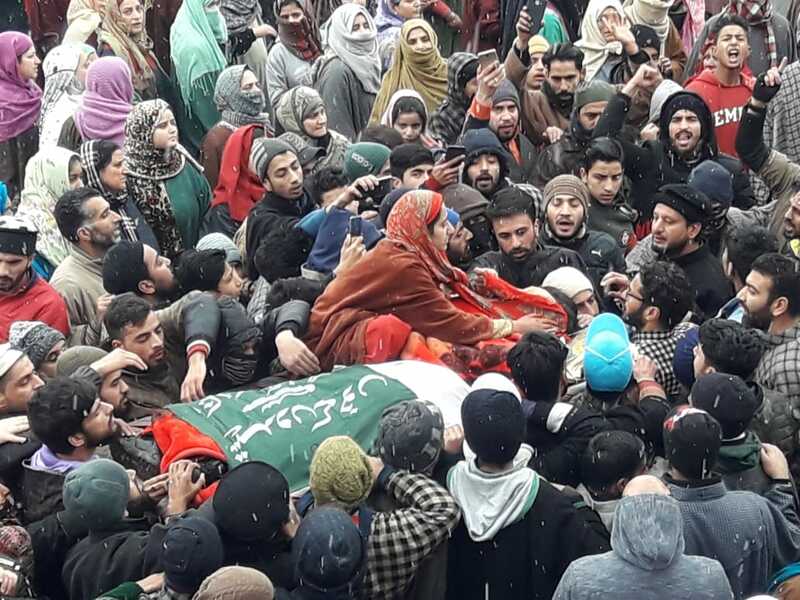 In Khanpora village of Baramulla large number of mourners shouting pro-freedom slogans carrying slain slain commander’ Shoaib Akhoon’s body in a procession to the graveyard for burial. In Old town Baramulla slain Nisar and slain Mosin’s bodies were carried by thousands of mourners from their homes to a local graveyard where there funeral prayers were held. Meanwhile a spontaneous shutdown is being observed in parts of Baramulla to mourn the killing of three local militants. Meanwhile, in wake of the killing of militants, authorities suspended internet services in parts of Baramulla as a precautionary measure to maintain law and order problem. Pertinently DGP JK Dilbagh Singh declared Baramulla as “Kashmir’s first militant free district after 29 years after killing of three last surviving Local LeT militants yesterday.